Our choice of a mate is an extremely important decision. Once a man chooses a woman to become his wife, she is his companion, the mother of their children, and the keeper of their home. 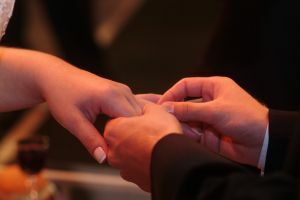 Before he chooses his best man, he needs to give much thought into this serious matter of selecting a mate. It is vitally important that he select a godly woman as she will know Jesus' teachings and she will be a committed Christian. As God taught the Jews, He gave them commandments to be obeyed. One commandment was their not marrying outside of His people. We read in Deuteronomy 7:3-4," Nor shall you make marriages with them. You shall not give your daughter to their son, nor take their daughter for your son. For they will turn your sons away from following Me, to serve other gods; so the anger of the Lord will be aroused against you and destroy you suddenly. " God does not want us to marry those who might lead us away from Him. We are warned about marrying mates who are not believers of the Lord and how that can lead us into apostasy. The word apostasy means a rejection of your beliefs (often in favor of opposing beliefs). Another meaning of apostasy is a total desertion or departure from a cause. The Old Testament is there for our learning. Over and over we read of men taking as wives the women of foreign lands. In these foreign lands, the people did not follow the Lord's commands. Anyone who married someone from another land was risking falling into apostasy. Solomon married many women from these lands for political reasons. Instead of conflict and war between their countries, they became allies. Notice I Kings 3:1," Now Solomon made a treaty with Pharaoh king of Egypt, and married Pharaoh's daughter; then he brought her to the city of David until he finished building his own house, and the house of the Lord, and the wall all around Jerusalem. " She was Solomon's primary wife and she might have been unable to bear children. The Lord God has continually wanted His people to keep in the forefront of their minds that they are separate from the world. A man needs to stop and put much thought into any marriage proposal or discussion of marriage. The woman he marries will need to have values close to his and she will need to be kind and gentle. They should both want a Christian household. A man needs to ask himself, "Is the woman I am thinking about possibly becoming my wife a faithful Christian? Will she help me get to heaven, or will she turn me away from the Lord's teachings? Can I be certain she understands we are to be faithful to each other as Christ was to His church. Am I determined to be faithfully devoted to her and her alone? Will she leave her present lifestyle and live a new life together with me?" If we want children, we both need to discuss this before I pick out a tuxedo. In all decisions the man and the woman need to agree. Before we choose a restaurant for the rehearsal dinner, the man and woman both need to sit down and seriously talk about how we would raise our children. Am I willing to provide and care deeply for her and the children and put them second only to God and Jesus Christ? Read in Revelation 21:2," And I saw the holy city, the new Jerusalem, coming down out of heaven from God, prepared as a bride adorned for her husband. " When we look at how Christ loved the church in that He gave Himself for it, we learn that husbands are to love their wives as Christ loved the Church. Ruth and Boaz had a son named Obed. Boaz and Obed are listed in the lineage of King David. We read in Matthew 1:5-6 ," Salmon begot Boaz by Rahab, Boaz begot Obed by Ruth, Obed begot Jesse, and Jesse begot David the king, and David the king begot Solomon by her who had been the wife of Uriah." A wonderful Biblical example of a wife working fervently for the Lord alongside her husband is Priscilla. " And he found a certain Jew named Aquilla, born in Pontus, who had recently come from Italy with his wife, Priscilla (because Claudius commanded all the Jews to depart from Rome); and he came to them. " Acts 18:2 Paul in writing to the Christians in Romans 16:3 said," Greet Priscilla and Aquilla, my fellow workers in Christ Jesus." Esther is another example we read about in the Bible. Esther became the wife of King Ahasuerus. She was extremely courageous as she endangered herself so she could save her people. Will the woman I choose for a wife love and watch our children and grandchildren grow alongside me? Will she want to be married to me until death parts us? And will I be happy with her being a wife, mother and possibly a homemaker? 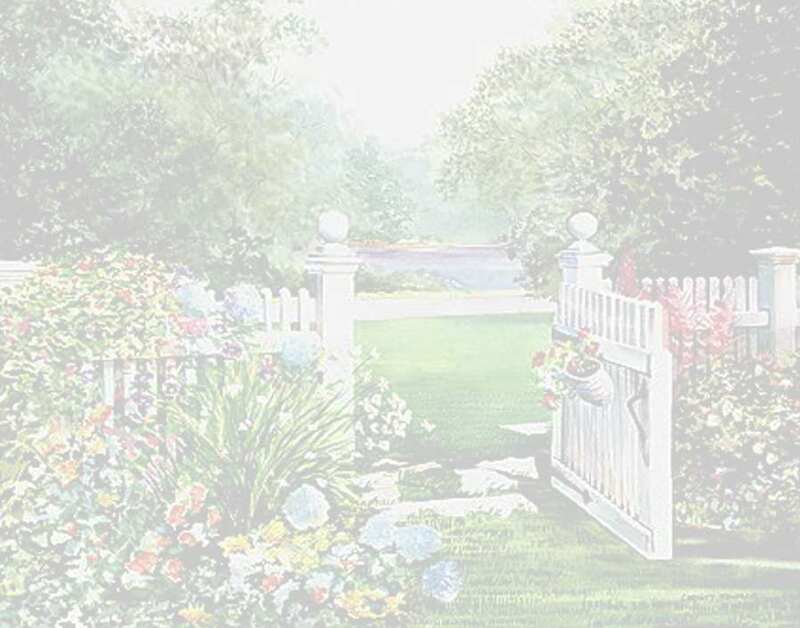 When we think of what that term ' homemaker' really means, it is an honor to be able to stay home and make the home a Godly home. Even if she is only able to stay home for a couple of years with your children, she will be able to give them a firm foundation. We read of the virtuous woman in the book of Proverbs. 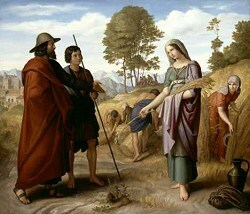 This woman was an industrious wife who was actively doing things for the betterment of her family. A husband should want a wife who will busily care for their family. 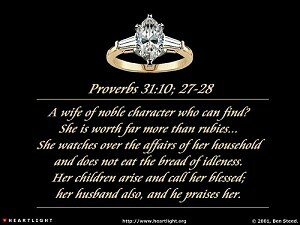 The virtuous woman's story can be found in Proverbs 31. Jesus Christ has unconditional love for us. He died for us and rose again and ascended to heaven to be with God, His Father. We need to have unconditional love for our wives and our children. In Ephesians 5:25," Husbands, love your wives, just as Christ loved the church and gave himself up for her." (1) Why is it so important to choose a godly wife? (2) What can happen if we marry a wife who is an unbeliever? (3) What does God want his people to keep in the forefront of their minds? (4) What Biblical example do we have of unconditional love?